Local Builder Inducted Into Hall of Fame - The Knutson Companies | Homes. Neighborhoods. Lifestyles. | The Knutson Companies | Homes. Neighborhoods. Lifestyles. Don Knutson, President of The Knutson Companies, Honored by Great American Living Awards. 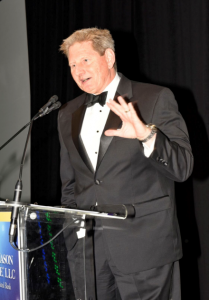 LEESBURG, VIRGINIA, UNITED STATES, November 17, 2017 /EINPresswire.com/ — Local builder Don Knutson, President of The Knutson Companies in Leesburg, VA, was named to the Great American Living Award’s (GALA) Hall of Fame on October 5th. GALA recognizes companies and individuals for excellence in the new home building industry in Virginia, Maryland, District of Columbia, West Virginia, and Delaware, in more than 40 categories, but the Hall of Fame acknowledges more than business acumen and design excellence – it honors a broader commitment to the industry, customers, and the community. “Nothing in life is achieved by yourself. In everything I’ve done, people have looked out for me, helped me out, and taken a special interest in what I was doing. If you see someone who you can help achieve something, make something happen, make themselves better, or help their community, you should do it. Pick someone out in the next three to six months and help that person achieve something they otherwise couldn’t do by themselves,” stated Knutson. After more than 25 years in the homebuilding industry, including careers with Winchester Homes and Beazer Homes in Northern Virginia, Knutson started his own company in 2012. Since then, his passion for innovative design, architecture, and construction has culminated into the walkable neighborhoods of Crescent Place, a townhome community in Leesburg, VA; Brambleton Town Center, a townhome community in the heart of Downtown Brambleton, VA, and Brambleton Town Center South, another townhome community in Brambleton, VA. Additionally, Don has several new urban designed communities scheduled to come online in 2018 and 2019. As a member of the Northern Virginia Builders Industry Association (NVBIA), he co-founded HomeAid Northern Virginia (HANV), a charitable nonprofit that leverages the resources of the building industry to build, renovate, or repair homeless shelters; transitional housing; and similar projects. He currently serves on the HANV Board of Directors. In 2001, he was recognized as Builder of the Year by NVBIA. In addition to co-founding HomeAid Northern Virginia, Don was the Builder Capitan of their first project. In 2008 he received the Presidents’ Circle Award from HANV. Then, in 2016, he served as Builder Captain for the Woman Giving Back (WGB) store expansion, in Sterling, VA. The Knutson Companies has also committed to an upcoming HANV project in Loudoun County, slated to begin late in 2017. To learn more about Knutson Companies, please visit them online at www.knustoncos.com.